The only place where a church full of people comfortably packed together behind rows of tightly jammed primary school cafeteria tables can evoke a feeling of calm, jubilation, and enlightenment is at the bi-annual Toronto Small Press Book Fair. Now don’t let a pathetic, blown-out-of-proportion argument scare you away—even if the ‘fight’ was taken to the Facebook front, now harbouring two distinct factions, the Toronto Small Press Book Fair group, and the Friends of the Toronto Small Press Book Fair group. Filled with all kinds of interesting and book-savvy individuals, the fair is a great place to find an array of quality (sometimes hand-crafted) books, chapbooks, zines, journals, poems in pots, trinkets, and countless other wonderfully unique items. From micro presses to medium sized presses, to those who have ventured into self-publishing, the fair represents only a fragment of Toronto’s small press community, but it is a natural place for the aspiring writer to flock to in order to gain insight on how to etch their way into the publishing world. Continuing to unite Toronto’s literary community, the fair reminds us about the heart of the craft. 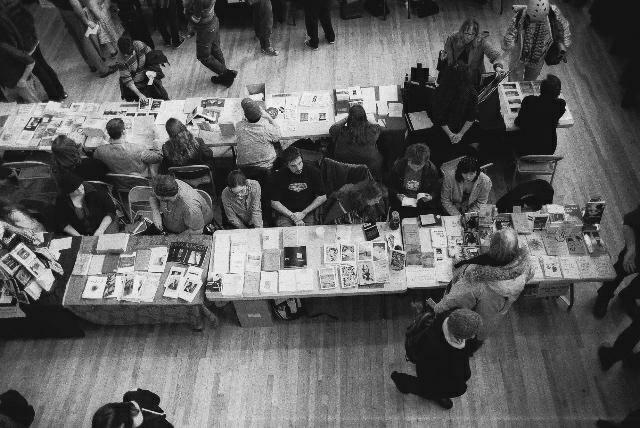 Photo from the Toronto Small Press Book Fair website.